The Global Volcanism Program has no activity reports for Santorini. The Global Volcanism Program has no Weekly Reports available for Santorini. 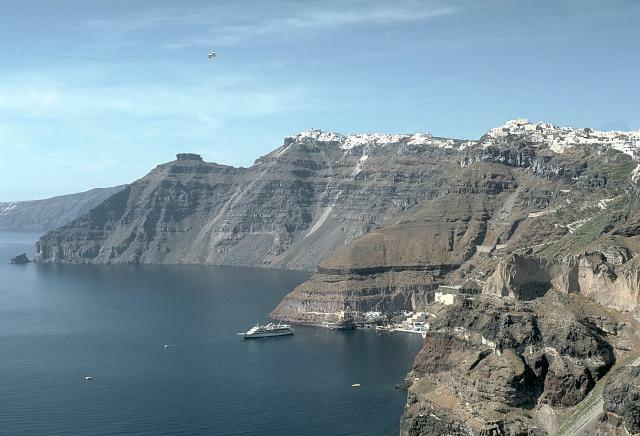 The Global Volcanism Program has no Bulletin Reports available for Santorini. Renowned Santorini (Thera), with its steep-walled caldera rim draped by whitewashed villages overlooking an active volcanic island in the center of a caldera bay, is one of the scenic highlights of the Aegean. The circular island group is composed of overlapping shield volcanoes cut by at least four partially overlapping calderas. The oldest southern caldera was formed about 180,000 years before present (BP), followed by the Skaros caldera about 70,000 years BP, and then the Cape Riva caldera about 21,000 years BP. The youngest caldera formed about 3600 years BP during the Late-Bronze-Age Minoan eruption that forced abandonment of the thriving Aegean Sea island. Post-Minoan eruptions beginning in 197 BCE constructed a series of lava domes and flows that form two islands near the center of the caldera. A submarine eruption took place in 1650 CE outside the caldera NE of Thera. The latest eruption produced a small lava dome and flow in 1950, accompanied by explosive activity. Barton M, Huijsmans J P P, 1986. 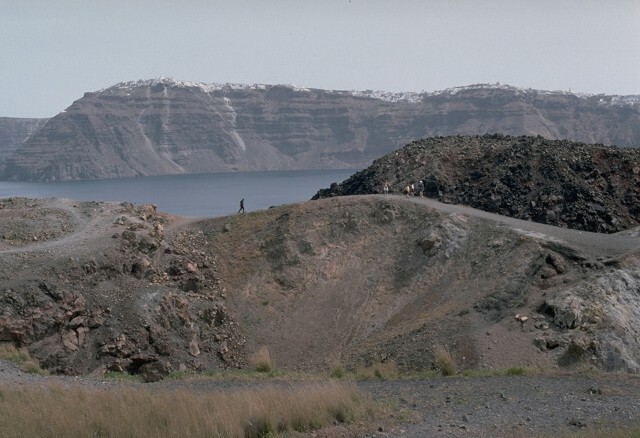 Post-caldera dacites from the Santorini volcanic complex, Aegean Sea, Greece: an example of the eruption of lavas of near-constant composition over a 2,200 year period. Contr Mineral Petr, 94: 472-495. Druitt T H, Edwards L, Mellors R M, Pyle D M, Sparks R S J, Lanphere M, Davies M, Barreirio B, 1999. Santorini volcano. Geol Soc London Mem, 19: 1-165 and 1:20,000 geol map. Druitt T H, Francaviglia V, 1992. 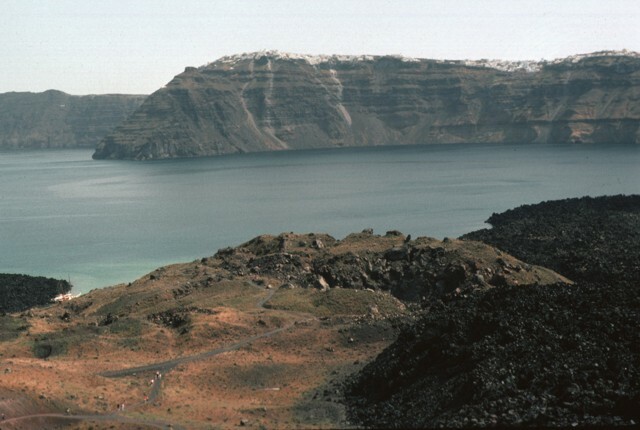 Caldera formation on Santorini and the physiography of the islands in the late Bronze age. Bull Volcanol, 54: 484-493. Druitt T H, Mellors R A, Pyle D M, Sparks R S J, 1989. Explosive volcanism on Santorini, Greece. Geol Mag, 126: 95-126. Fouque F, 1879. Santorini et ses Eruptions. Masson G (ed), Libraire l'Academie de Medicine, Paris, 440 p (English translation by A R McBirney published by Johns Hopkins Univ Press, 1998). Friedrich W L, 2000. Fire in the Sea, The Santorini Volcano: Natural History and the Legend of Atlantis. London: Cambridge Univ Press, 258 p.
Friedrich W L, Kromer B, Friedrich M, Heinemeier J, Pfeiffer T, Talamo S, 2006. Santorini eruption radiocarbon dated to 1627-1600 B.C.. Science, 312: 548. Fytikas M, Kolios N, Vougioukalakis G, 1990. Post-Minoan volcanic activity of the Santorini volcano: volcanic hazard and risk, forecasting possibilities. In: Hardy D (ed) Thera and the Aegean World III, London: Thera Foundation, 2: 183-198. Gertisser R, Preece K, Keller J, 2009. The plinian Lower Pumice 2 eruption, Santorini, Greece: magma evolution and volatile behavior. J. Volcanol. Geotherm. Res., 186: 387-406. Hardy D (ed), 1990. Thera and the Aegean World III. London: Thera Foundation. Heiken G, McCoy F, 1984. Caldera development during the Minoan eruption, Thira, Cyclades Greece. J. Geophys. Res, 89: 8441-8462. Higgins M D, 1996. Magma dynamics beneath Kameni volcano, Thera, Greece, as revealed by crystal size and shape measurements. J. Volcanol. Geotherm. Res., 70: 37-48. Kaloyeropoyloy A (ed), 1971. Acta of the 1st International Science Congress on the Volcano of Thera, held in Greece, 15th-23rd September, 1969. Athens: Arch Serv Greece, 436 p.
Manning S W, Ramsey C B, Kutschera W, Higham T, Kromer B, Steier P, Wild E M, 2006. Chronology for the Aegean Late Bronze Age 1700-1400 B.C.. Science, 312: 565-569. McCoy F W, Heiken G, 2000. 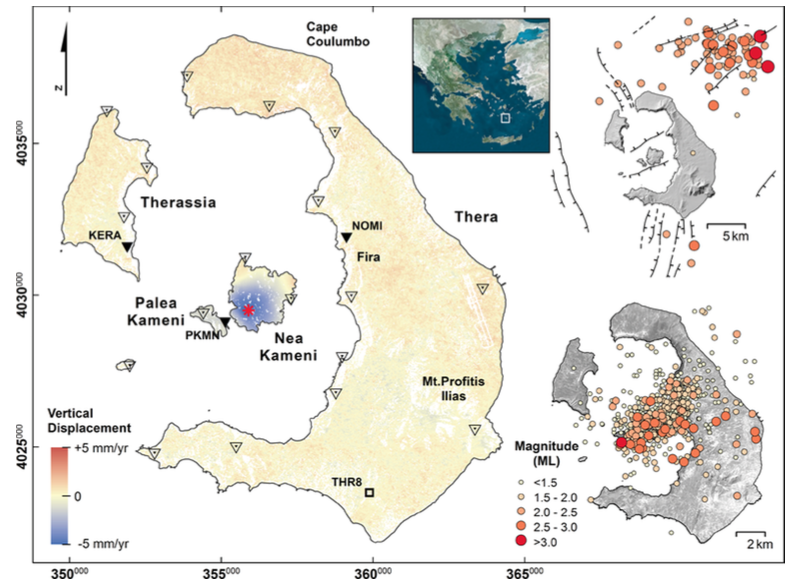 The late-Bronze age explosive eruption of Thera (Santorini), Greece: regional and local effects. In: McCoy F W, Heiken G (eds), Volcanic Hazards and Disasters in Human Antiquity, Geol Soc Amer Spec Pap, 345: 43-70. Sigurdsson H, Carey S, Alexandri M, Vougioukalaki G, Croff K, Roman C, Sakellariou D, Angagnostsu C, Rousakis G, Ioakim C, Gogou A, Ballas D, Misaridis T, Nomikou P, 2006. Marine investigations of Greece's Santorini volcanic field. Eos, Trans Amer Geophys Union, 87: 337, 342. Taddeucci J, Wohletz K H, 2001. Temporal evolution of the Minoan eruption (Santorini, Greece), as recorded by its Plinian fall deposit and interlayered ash flow beds. J. Volcanol. Geotherm. Res., 109: 299-317. Vespa M, Keller J, Gertisser R, 2006. Interplinian explosive activity of Santorini volcano (Greece) during the past 150,000 years. J. Volcanol. Geotherm. Res., 153: 262-286. Vougioukalakis G, 1996. Santorini, Guide to "The Volcano". Institute for the Study and Monitoring of the Santorini Volcano, 82 p.
Remarks: The 2011-2012 uplift episode is coincident with seismic unrest and is likely due to magmatic activity. 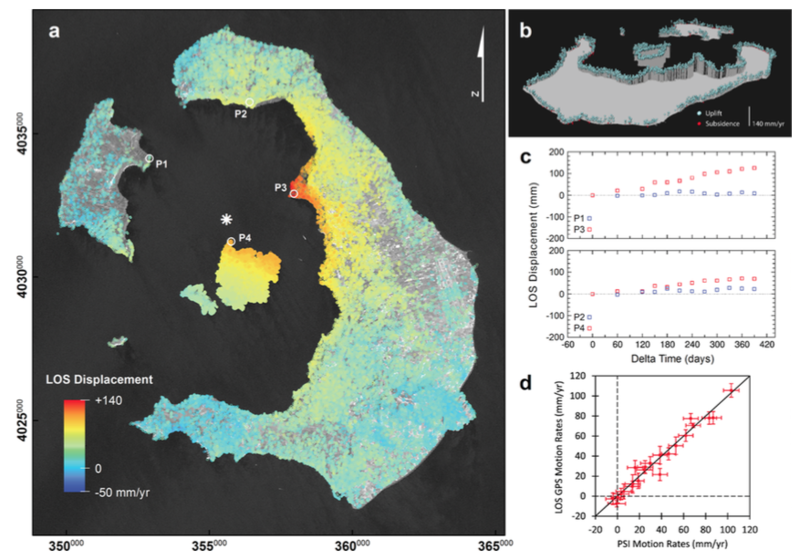 (a) PSI LOS displacement rates from ENVISAT ASAR data (2011 March?2012 March) showing the radial inflation pattern caused by the volcanic unrest, (b) perspective 3-D view of the point targets along the coastline of Santorini, (c) deformation histories of selected point targets and (d) correlation between GPS motion rates projected into the LOS geometry and PSI results after correction of reference frame, with error bars representing the 1-sigma confidence region. From: Foumelis et al. 2013. Reference List: Foumelis et al. 2013; Newman et al. 2012; Papoutsis et al. 2013; Parks et al. 2012. Foumelis, M., E. Trasatti, E. Papageorgiou, S. Stramondo, and I. Parcharidis, 2013. Monitoring Santorini volcano (Greece) breathing from space. Geophysical Journal International, 193, p. 161-170. Parks, M. M., J. Biggs, P. England, T. A. Mather, P. Nomikou, K. Palamartchouk, X. Papanikolaou, D. Paradissis, B. Parson, D. M. Pyle, C. Raptakis, V. Zacharis, 2012. Evolution of Santorini volcano dominated by episodic and rapid fluxes of melt from depth. Nature Geoscience, 5: 749-754. Remarks: Rapid subsidence centered at Nea Kameni preceded the 2011-2012 uplift episode. Remarks: A concentric deflation pattern cenetered at the southern part of Nea Kameni was observed between 1992 and 2010, prior to the 2011-2012 unrest. Measurements made with the ERS and Envisat satellites show slightly lower rates of deformation than ALOS measurements. Vertical ground surface displacement rates for the period of 1992?2010 (18 yr), calculated based on ERS-ENVISAT ascending and descending data. Local reference point (THR8, after Newman et al. 2012) is denoted as square. The star marks the inferred location of the Mogi source (see text). Triangles indicate geodetic GPS stations from Newman et al. (2012), continuous (black) and campaign sites (transparent). The regional seismicity of the area between 2000 and 2010 (rest phase; AUTH) and the main fault systems (Perissoratis 1995) are shown (upper right corner), whereas the contemporary seismic activity during the unrest episode (AUTH, 2011 January?2011 June and NOA, 2011 July?2012 March) is also given (lower right corner). There is no Emissions History data available for Santorini. The gentle outer flanks of the Santorini caldera, mantled by deposits of the 3500-year-old Minoan eruption, provide a setting for croplands and island villages. This view, looking NW from Mt. 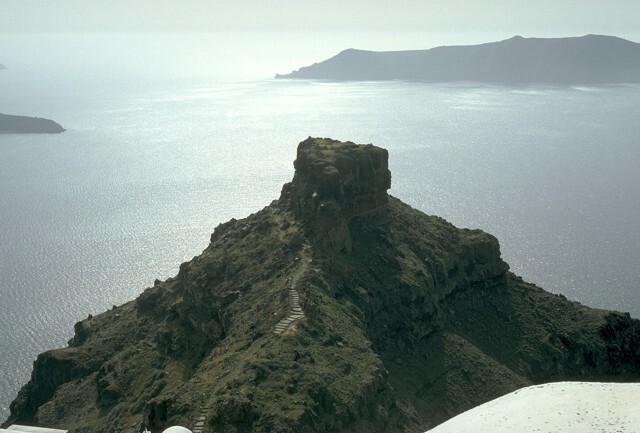 Profitis Ilias, a limestone peak forming the high point of the island of Thera, shows the northern half of the 7.5 x 11 km caldera. Its northern rim drops below sea level, leaving a channel between the tip of Thera and the island of Therasia at the left. The steep inner walls of Santorini, capped by whitewashed villages, drop steeply into the caldera bay, forming one of the scenic highlights of the Aegean. Pyroclastic-flow deposits from four caldera-forming eruptions dating back to 100,000 years ago are exposed in the caldera walls in this north-looking view. The youngest caldera was formed about 3500 years ago during the noted Minoan eruption of Santorini. The flat-topped peak on the left skyline is Skaros, a remnant of a shield volcano constructed within a previous caldera. The steep eastern caldera walls of Santorini are draped by the whitewashed houses of the town of Firá, many of which were excavated within deposits of the late Bronze Age Minoan eruption that took place about 3500 years ago. 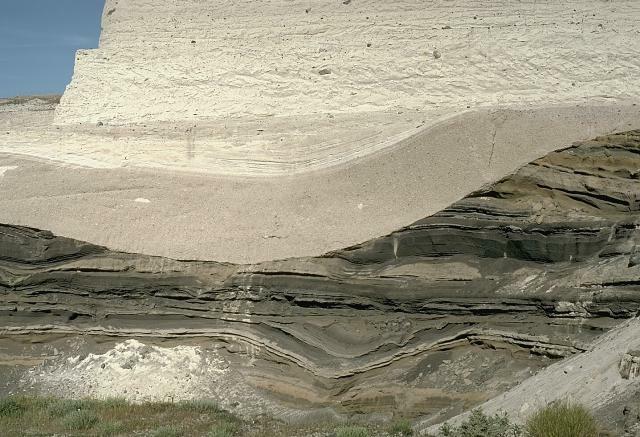 The most prominent unit in the caldera wall at this location is the Middle Tuff Sequence, the lighter-colored, cliff-forming unit halfway up the wall that is composed of a basal pumice-fall deposit overlain by lag-breccia and pyroclastic-flow deposits. The Middle Tuff and the darker bedded layers overlying it were deposited during late-Pleistocene eruptions of Santorini. 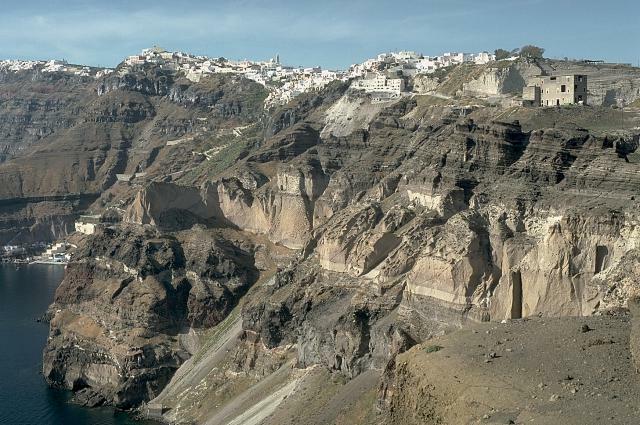 This spectacular outcrop shows light-colored deposits from the 3500-year-old Minoan eruption of Santorini volcano filling a valley cut in darker, bedded ashfall layers of Pleistocene age. The lower, beige-colored unit filling the ancient valley is a pumice-fall deposit from vertical explosions early in the eruption. It is overlain by laminated pyroclastic-surge deposits produced when water gained access to the magma reservoir as the volcano collapsed into the sea. The upper whitish layer truncating both these deposits is a pyroclastic-flow deposit. The course of the late Bronze Age Minoan eruption of Santorini is charted by this roughly 10-m-thick exposure of deposits produced by the 3500-year-old eruption. 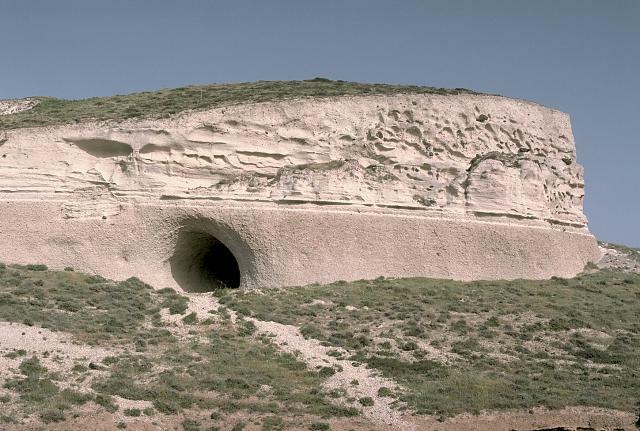 The loosely compacted basal pinkish layer (excavated here by a circular storage tunnel) is formed of early airfall pumice deposited from powerful vertical eruption columns. It is overlain by lighter-colored, laminated deposits of pyroclastic surges produced when water gained access to the eruption column as caldera collapse began. The thicker, upper unit consists of pyroclastic-flow deposits. During Medieval times the Skaros promontory, formed of lavas of the Skaros shield volcano, was a densely populated catholic fortress bristling with buildings. The fortress was constructed because it offered protection from pirates, but following a series of strong earthquakes accompanying the 1707-1711 and other eruptions, it was progressively abandoned, and few building remnants remain. Therasia Island lies across the caldera at the upper right, and the tip of Nea Kameni Island in the center of the caldera appears at the left. Wave erosion has exposed a cross section through bedded scoria layers of the Cape Mavrorachidi cinder cone on the SW side of Thera Island. Behind the cone to the left are exposures of light-colored rhyodacitic tuffs of the Early Centres of the Akrotiri Peninsula. A Potassium-Argon date of 522,00 +/- 104,000 yrs Before Present (BP) and a more accurate 451,000 +/- 27,000 BP Argon-Argon date were obtained from a lava flow from the Cape Mavrorachidi cone. 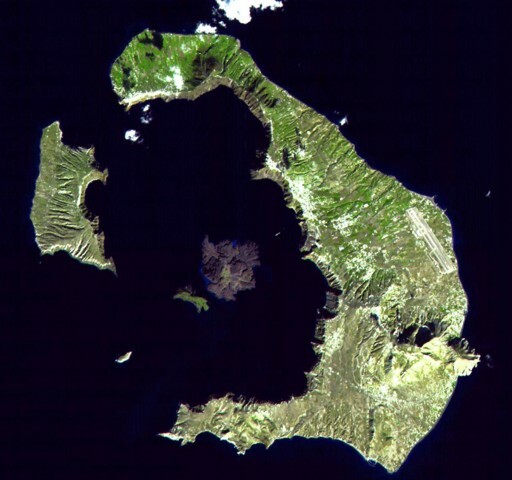 The cinder cone is one of several cinder and spatter cones formed on the Akrotiri Peninsula. The headland of Cape Thera rises above Phira harbor. 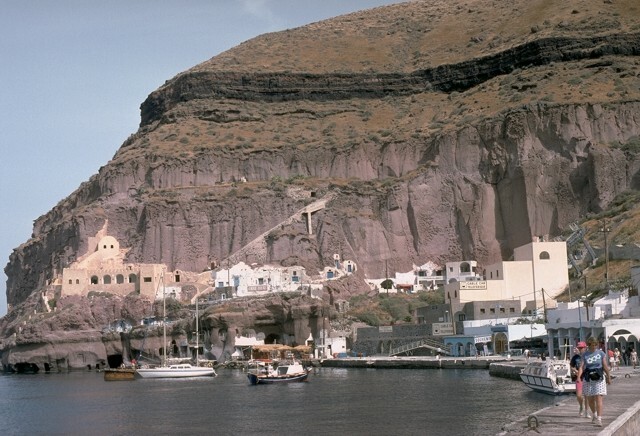 The massive light-brown, cliff-forming unit above the harbor is the Cape Thera Ignimbrite. Above the cliffs is a sequence of sloping minor pyroclastics and paleosols, which underlies the prominent thinner dark-colored layer at the top of the photo. This is the Middle Pumice unit, a welded plinian pumice-fall deposit erupted about 100,000 years ago and thought to originate from a vent west of Phira. The lower-angle slopes above it are lithic breccias of the Middle Pumice eruption. The blocky dacitic lava flow at the right is part of the Dafni lavas, erupted early in the course of an eruption that lasted from 1925 to 1926. The east wall of Santorini caldera, capped by the town of Firá, rises across the caldera bay. The 1925-1926 eruption, like many other of Santorini's post-caldera eruptions, began with submarine explosions and lava effusion. Explosive activity was unusually strong during this eruption, producing eruption columns up to 3.2 km high. The dark-colored lava flow at the right center of the photo and the crater in the foreground were formed during an eruption from 1939 to 1941. 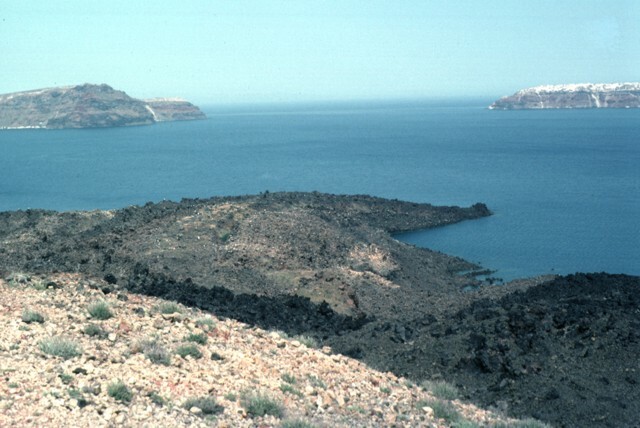 The 1939-41 lava flows traveled to the east and west, reaching almost to the sea on the east side and extending into the caldera bay at several location on the west side on Nea Kameni island. A chain of N-S-trending craters was formed during the eruption. The crater seen in this photo cut lava flows of an earlier 1866-1870 eruption. The town of Firá caps the rim of Santorini caldera along the horizon. Palaea Kameni (Thia) Island in the center of the photo was formed by the extrusion of lava flows during a 46-47 CE eruption. This was the second documented eruption producing a new island in the caldera bay. The black lava flows in the foreground on Nea Kameni island were emplaced during an 1866-1870 eruption. The small island in the right distance to the SW, capped by light-colored rocks of the 3600-year-old Minoan eruption, is part of the caldera wall, which extends beneath the sea surface to the Akrotíri Peninsula on the extreme left. 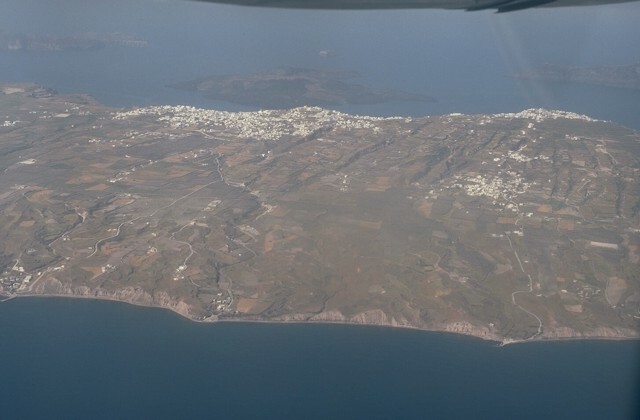 An aerial view from the east overlooks the outer flanks of Santorini's 7.5 x 11 km caldera. The far caldera rim, part of which is flooded by the sea, appears at the upper left and right. The towns of Firá and Merovígli cap the caldera rim, and farms drape the outer flanks of the volcano, which are underlain by deposits from the cataclysmic Minoan-age eruption about 3500 years ago. The post-caldera islands of Nea and Palaea Kameni (upper-center) were constructed in the middle of the caldera during eruptions dating back to 197 BCE. The crater in the foreground was formed during an eruption from 1570-1573 CE. The eruption was the first in more than 800 years from Santorini. 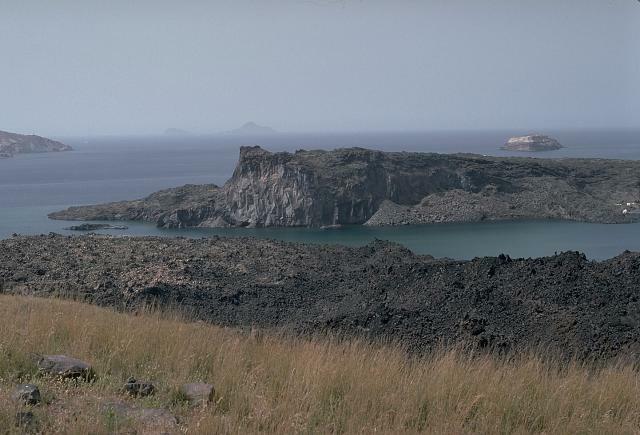 Initially submarine eruptions were followed by the formation of the new island of Mikri Kameni (Little Burnt Island) NE of Palaea Kameni Island. The 1570-73 eruption created a small dome-shaped island with a diameter of about 400 m and a height of 70 m, topped by a 20-m-deep crater. The western wall of Santorini's caldera appears in the background, capped by the houses of the village of Merovígli. 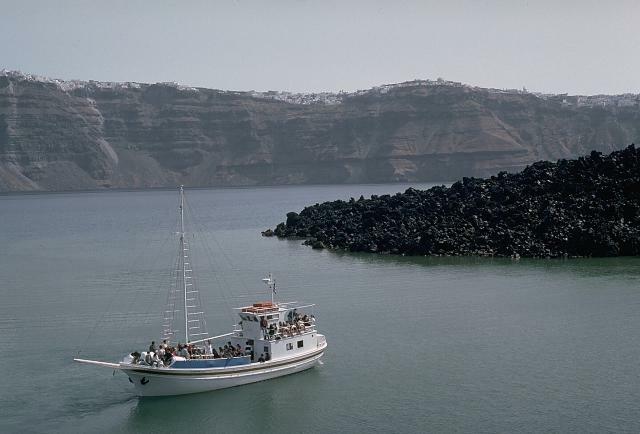 The black lava flows that descend into Santorini's caldera bay are the Dafni lavas, erupted during 1925-26. 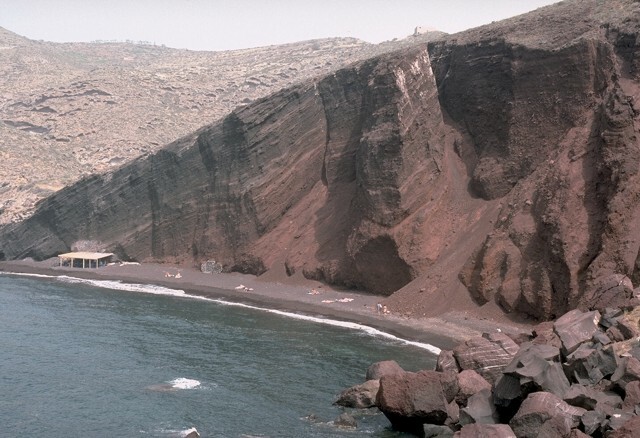 During this eruption, which began in August 1925 and lasted until January 1926, Nea Kameni became a single island as the Dafni lavas united Mikra Kameni, Nea Kameni and Georgios domes. Eruptions resumed in May 1926, when small pyroclastic flows occurred. The steep-sided eastern caldera wall rises in the distance, capped by the town of Fira and the smooth-textured pyroclastic-flow deposits of the Minoan eruption. The lava flow forming the peninsula (center) dates back to an eruption during 1707-1711. Nea Kameni Island was formed between Palaea and Mikri Kameni islands during alternating explosive and effusive activity that began with uplift of a small islet of pumice called Aspronisi (White Island). Following the eruption the new island became dotted with small churches and buildings used by residents of Santorini who came to swim in the thermal springs. The caldera-rim islands of Thirasia (left) and Thira (right) can be seen in the distance to the NW. 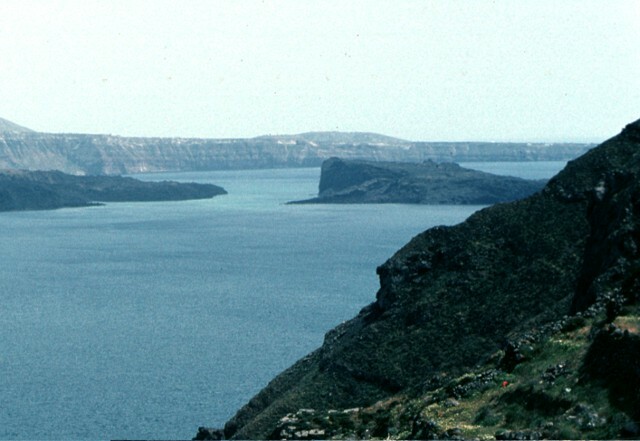 Palaea Kameni Island (right-center) rises from Santorini's caldera bay SE of the foreground cliffs of Thirasia Island. The higher, flat-topped part of the island was formed during 46-47 CE, and the gentler slopes in front of it date back to 726 CE. The highly explosive eruption of the summer of 726 produced great quantities of pumice and ash that were transported as far as the islands of Abydos and Lesbos, Asia Minor, and Macedonia. Extrusion of the Ayios Nikolaos lavas followed, which eventually joined the NE tip of Thia (Palaea Kameni) Island. The dramatic mostly submerged caldera of Santorini volcano is seen from space in this satellite image from NASA. The 11 x 7.5 km caldera was formed during at least four major explosive eruptions, the last of which occurred during the Bronze Age about 1650 BCE. 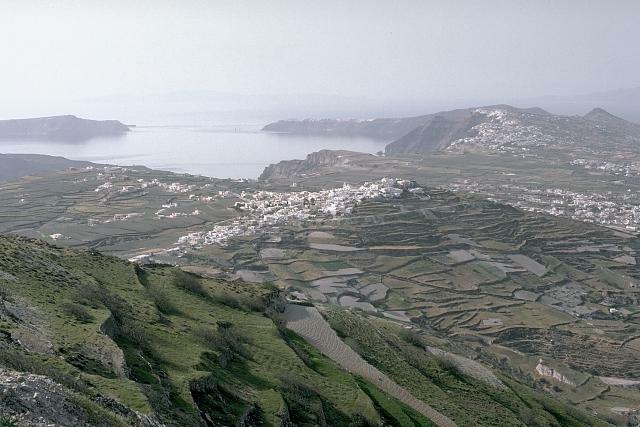 The arcuate islands of Thira (right) and Therasia (left) form the outer flanks of the caldera. 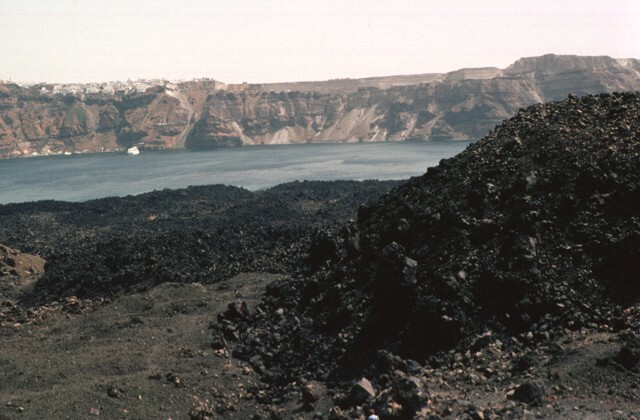 The darker area near the center of the caldera is Nea Kameni Island, which along with Palea Kameni Island to its left, is part of a post-caldera cone formed during historical eruptions dating back to 197 BCE. ASTER satellite image, 2000 (NASA, http://eol.jsc.nasa.gov/). Large Eruptions of Santorini Information about large Quaternary eruptions (VEI >= 4) is cataloged in the Large Magnitude Explosive Volcanic Eruptions (LaMEVE) database of the Volcano Global Risk Identification and Analysis Project (VOGRIPA).